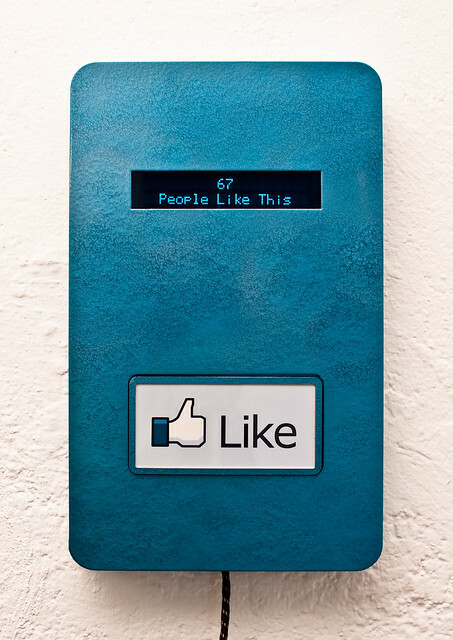 Munich-based “computational artisan”, Mario Klingemann, created the interactive piece Like This based on Facebook’s well-known Like button. It is not connected to Facebook since for obvious reasons it is not possible to register a “like” for another person without being logged in. Only the button design has been borrowed since it is such a cultural icon already and most people will immediately understand how to use it. Technically it contains an Arduino which takes care for permanently storing the count of button presses (so they do not get lost when the power is detached) and which also controls the display. Also what cannot be seen on the still photo is that you have to press the button for about a second during which a progress bar appears in order for your “Like” to count – so people who do not like it but still want to touch it can do so. The idea was to create a self-referential artwork that shows how many people like it. Apart from that I find it interesting to have an object in a gallery or show that is not only allowed to be touched but actually supposed to be. It will be shown at the Ultra Social exhibition at the Urban Arts and Media Organization (UAMO) Festival 2011 in Munich from October 27-30, 2011.